The Holy Eucharist is the sacrament commanded by Christ for the continual remembrance of His life, death, and resurrection, until His coming again. The Eucharist, the act of praise and thanksgiving of the Church, is the way by which the sacrifice of Christ is made perfect, and in which He unites us to His one offering of Himself. 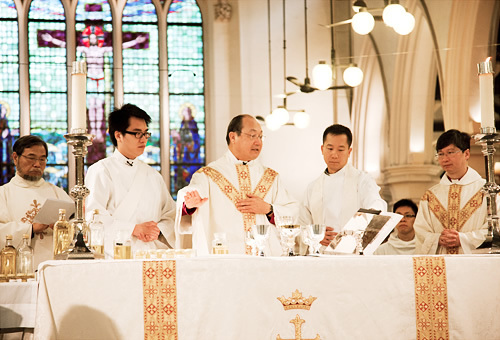 As a Sacrament, the outward and visible sign in the Eucharist is bread and wine consecrated, given and received according to Christ’s command. The inward and spiritual grace in the Eucharist is the body and blood of Christ given to His people, and received by faith. We receive the grace of the forgiveness of our sins, the strengthening of our union with Christ and one another as we are nourished our eternal life when we receive the Lord’s Supper. When we come to the Eucharist, we should examine our lives, repent of our sins, and be in love and charity with all people and intend to lead the new life of Christ.